Samsung I8000 Omnia II TMC Driver 81347 visit from 2010.01.07. 2010-01-17: Sucessfully implemented the GFMAPI, so the PowerRadio and moreover the iGO with TMC support is working with HyperGPS. The log format and content changed , for better readability the first entry always the elapsed msec value from the previous log line. Also there is a separate Info,Command,Channel,RDS and TMC group. To help determine the quality of the TMC reception and enable to use the IGo,etc. TMC feature without the HyperGPS installed, here is the rdsradio.CAB [2010-09-30]. Because the present solution use static COM6 as TMC port and for the serial driver installation must reboot the device, here is a program without the serial driver: rdsradio_noserial.CAB [2010-09-30] - in this version no COM6, so the TMC tab disabled; this program cannot act as TMC driver, otherwise all feature working. 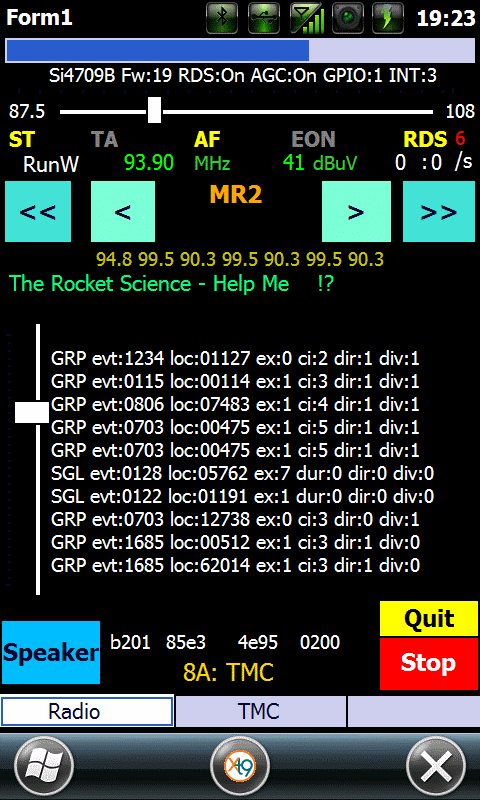 In the case anybody has trouble with the GFMAPI, I strongly suggest to use rdsradio to check - if you have no 10:2 /s below the RDS text, the receive quality is bad. The quality of the RDS reception NOT in directly proportional to the signal level, at very strong signal the RDS error rate can be high also!!! To remove the installed COM6 port, you need to delete all entries within HKLM/Drivers/Builtin/Serial6, soft-reset the device, delete the /Windows/phj_virtcomm.dll and remove the Serial6 entry also. The final version the rdsradio.exe will be used as checking tool and parameter setup program, and another little C++ program will transfer the tmc data ( this is a .NET C# one ) - and somehow the serial driver activation/deactivation must happen run-time. ST=stereo, TA=Traffic announcement, AF=frq lock EON=Enhance Other Network RDS=Radio Data System indicators, Yellow when active. Past the RDS indicator may be a red number, this indicate the amount of corrected RDS errors by the chip, in the case it is 6 means uncorrectable number of errors. 93.9 Mhz is the tuned frequency, 41 dBuV is the received signal strenght, the first zero is the received number of RDS packets in the last second, past the : is the same, but for TMC data. For normal operation these numbers must be 10-11 and 3-4. The white lines is the decoded TMC informations. At the bottom the four hex word is the last sampled RDS info, below the Group type in number and text. The Stop button closes everything, including the radio, the Quit button leave the radio open.. The Navigation button open a dialog box, here you can select the navigation program to start. The selected program placed the line below for reference and stored in the registry (prog). The Start Navigation button starting the above selected program and from this point receive the Royaltek command and send the RDS data and the status over the virtual COM port. When the program started, the button text will be Stop Navigation-pressing kill the navi program, otherwise wait for the end of the navi prog. For testing the sent/received Royaltek messages appear in this tab. Download and install HyperGPS , From Program Files/ or My Storage/Program Files or Storage Card/Program Files/ ( depends on the installation ) /PowerRadio directory delete the gfmapi.dll. To simplify the above process, created two CAB files from the original ones ( thanks to BeemerTPPC and 6Fg8 for the original CAB's ). ver 1.13[2010-02-21] to avoid the keypress sound, send just the VK_NONAME KEYUP event. ver 1.10[2010-02-06] Not sending the FMFC_SEEK_IN_PROGRESS msg, because PowerRadio threat it as error 83..
ver.1.4 [2010-01-21] The default value of ms changed to 80 ms, minor rssi mods. ver.1.2 [2010-01-20] The TMC data query interval 80 ms instead of 800, so quicker you get the data. Both HyperGPS and my cab install the gfmapi.dll always to the /Windows directory, so using this order my dll will overwrite the original HyperGPS one. Start the HGPSClient.exe, select COM4: (or any other free COM port) as COM Port, select the protocol ( I'm used Royaltek ), etc. and Press the TMC button. In the iGO go to the TMC menu, select the com port and the Royaltek protocol ( or leave both automatic, the program will find the TMC) - and we are ready. - no known errors, except the audiopath: in the case the jack inserted, everything works fine, can switch to/from speaker/ear. But if not, all the four known method ( in the fmradio.dll, waveOutMessage, ossvcs.dll, WAV1: device) fail! In the beginning I decided to not allow to loose information again, so I opened a public SVN. 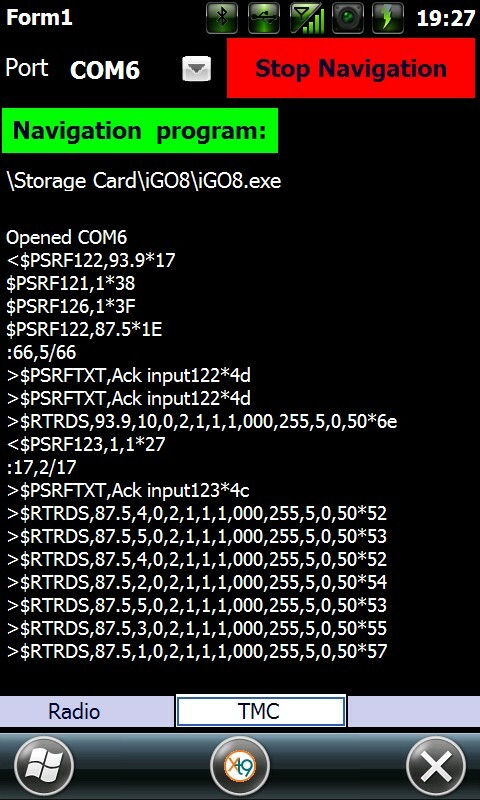 From there everybody can download the latest source code of the GFMAPI - at least the I8000 version. It is good for experiment, implementing new hardware, and also I'm willing to update it - if somebody send me the correction, because I cannot give write access for everybody to keep the code healthy. The URL : svn://linuxgw.phj.hu/public/gfmapi/trunk , it is a Visual Studio C++ project. FMR_Init() : first allocate a memory area using the MITsGetVirtualAlloc( 0x134 ) in mmi.dll. This is the MmMapIoSpace for the chip data. The started two threads, one for the chip interrupt handling and one for the AFC.